Spatio-temporal agents must preserve Earth's future, always. But is it still possible? Galaxity's orders are rather bizarre, lately. 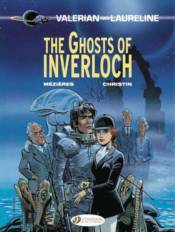 Laureline has been left on stand-by in a Scottish castle. Valerian, haunted by recurrent nightmares, has been sent to capture a sentient being as if it were a wild animal, an unsavory task, to say the least. And on Earth in the 1980s, members of the military and political elites are descending into madness one by one. What future does our planet still have, and who's so bent of changing it?